Del Mar 2017 is here! Where racing is king again and the only talk of field size is how busy 19th Street Beach gets before noon. No matter what's happening in the world there is always Del Mar. Breathe, soak it in, and enjoy our list for the Top 25 things to do this summer (and every summer) where the turf meets the surf. 1. There is only one thing better than waking up in Del Mar. Heading straight to the The Naked Cafe for breakfast. It's the most important meal of the day and you will never have a bad one starting off with the Buff Breakfast Burritos. 2. Spend the morning at the barn. The backside is horse heaven. See how hard your trainers and their staffs work and we promise you won't feel like they are just running up day rates not running your horses. 3. LRF Cares Letter Party August 24, 2017 at Jimmy O's. We are shutting down the legendary Del Mar watering hole for a costume party where everyone must dress in something that starts with the letter..... S. Last year it was D. Can you tell us what Brittney Eurton and Christina Blacker went as? Get your tickets early. 4. Sushi Ota. Rated by Zagat as the #1 sushi restaurant in San Diego. You're #1 if you can just find it. Yes, it's the IHOP looking spot in the mini-mall. Yes, it feels like an IHOP when you walk in. Remember the first time you had the silver dollar pancakes? You will remember your first time here too. Chunk and Mocha Madness. Even Bob Baffert waits in line. Ask him. 6. La Jolla Cove. Every year we try something new...usually in the water. This year's endeavor - Kayaking. As an attorney, we need to warn you that Southern California has been hit with a rash of great white shark sightings. As a beach lover, we'd like to tell the attorneys to shut it. 7. Buy a Pair of Supra Shoes. You can't look cool in Del Mar without the right kicks. The CEO is a Del Mar legend and nothing says you're back in town more. LRF partners get 40% off. Email us for the code. 8. Air & Space Museum, Balboa Park. The entire park is incredible but our favorite museum is an affiliate of the Smithsonian in D.C. This is a must for the lover of all things that fly. Between the actual Apolo 9 Command Module, the only real GPS satellite on display in the world and fun simulators, you better book out enough time to enjoy it all. 9. Cardiff Crack at Seaside Market. We've never met anyone who didn't have their lives changed by this three pound piece of pre-marinated tri-tip heaven. Like a drug, they don't need you. You need it. 10. Mission Cafe. It's no secret we love breakfast. And pancakes. And pancakes with bananas. Walk it off afterwards along Mission Beach. You're welcome. 11. LRF Cares Celebrity Softball Classic July 24th. Watch horse racing/San Diego celebrities play softball in a fun, summer setting. Also, see yourself on TV when it airs on TVG. Food, and drinks included. All proceeds will benefit our retired racehorses. 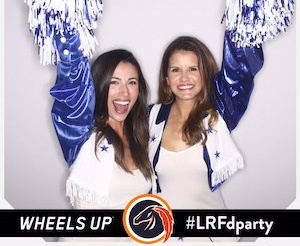 For VIP tickets, email LRF Cares Renee Parcell @ reneemparcell@gmail.com. 12. Private Tour of the Del Mar Racetrack. 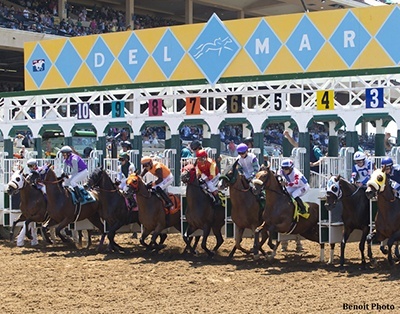 DMTC's Mac McBride walks you LRF Partners through the iconic racetrack with the best Del Mar stories you ever heard. This will be the most special 90 minutes of your summer. Email us for details. 13. Market Restaurant. We know it was on the list last year. And the year before. It will be here forever as long as they continue to serve the ribeye cap. For industry watchers, sitting in the bar is like mingling at the Oscars. 14. Hotel Indigo. You now have your alternative to L'Auberge and the Hilton. Big rooms, not so big prices. If you can't decide which hotel to stay in, you've been looking for this one. 15. Take in a Chargers Pre-Season Football Game. Too soon? 16. BBQ Championship. Last year we walked over to the pits, took one smell, and wished we lived in those campers outside the grandstands and BBQ'd all day. LRF Tip. You might miss a race. And you won't care. 17. Spend a Night at the Del. 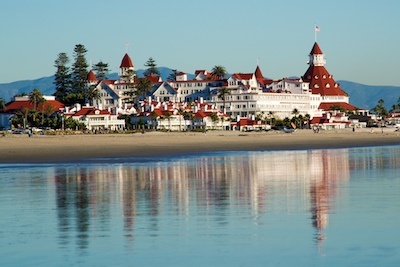 The Hotel del Coronado is no ordinary hotel. Built over 125 years ago, made out of wood (it is the second largest wooden building in America) and featured in many films including Some Like it Hot and Somewhere in Time, it isn't enough to visit for the day. Walk into town and you'll feel like you're on a vacation from your vacation. 18. Birch Aquarium. If it looks familiar, you've watched Finding Dory way too many times. Beautiful setting and a great outing for the whole family, especially the little ones. 19. La Jolla Playhouse. One of the most iconic playhouses outside of Broadway is right in your backyard. 28 productions that started here ended up in NYC, including Jersey Boys, Into the Woods and The Who's Tommy. Three new plays to choose from this summer. 20. Drive to the Top of Mt Soledad. It's fun, it's free and the views are amzaeballs. Check out the National Veterans Memorial and you will remember why you love both San Diego and America. 21. Chino Family Farms. Yes, it is "that shack" at the end of a long dirt road. You will feel like you're in Tijuana, but bring your wallet. You're actually on the Rodeo Drive of vegetable stands. 22. Thyme in the Ranch. Visiting Rancho Santa Fe is like walking onto a silent movie production set. Head back to an easier time and delicious BLT's. 23. Model Train Museum. Relive your childhood at the country's largest model railroad museum. See four enormous model layouts. A must for kids. Choo-Choo! 24. Watch the Grunion Run. Just hearing the words "Spawning on the beach" and we're sold. Click here for this summers Grunion Run Schedule. 25. Stay in and Order Pizza. When it's time to chill with a brew and a slice, click on Del Mar Pizza, Pizza Port, Leucadia Pizza and Crust. If you don't think Pizza is popular in Del Mar, head to the Leucadia Pizza parking lot where you'll see 9 delivery trucks waiting to leave.